The goblin trail leads into the wilds. Easy enough to follow; it offers but a small reward. As with many trails, the beginning and middle matter little. What matters is where it ends. This one ends at the gates of an underground fastness, a hold of stone and iron; the dungeon-home to the goblins and their black hearted masters. This is no simple goblin hole, nor lair of some larger beast. Here, beneath the earth, lies a sprawling dungeon, built long ago by a wizard for his own machinations. 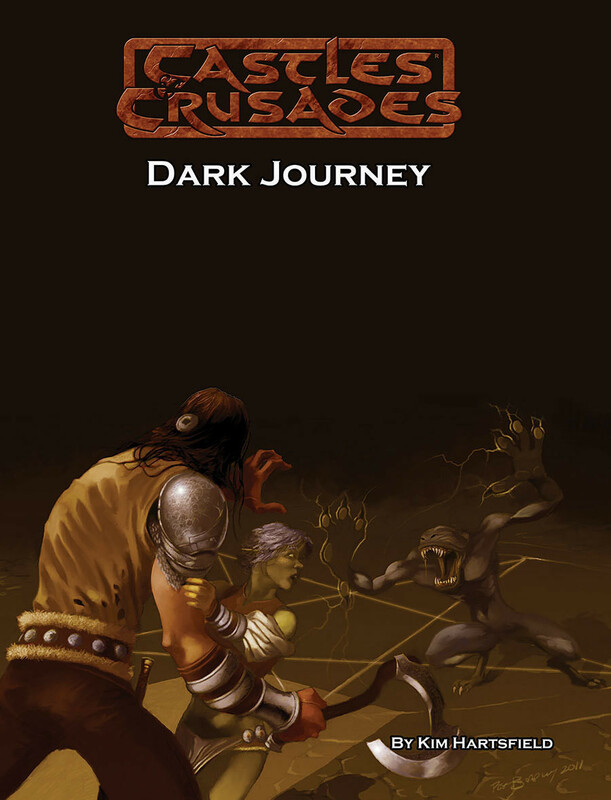 Dark Journey is a dungeon adventure cast in the classic mold. Here the CK is able to present the players a network of inter-connecting halls, chambers, cellars and more. A wizard's ancient hold, it offers libraries guarded by strange monsters, laboratories, cellars, trapped chambers and more. Herein lies the wizard's forgotten wealth, his magic, his money, his artifacts. But the adventurer must be wary. Wizards do not idly lay treasures about unless they protect them with guards, wards and monsters summoned from dark places. Beneath the earth lies adventure, wealth, and glory; vastly superior to the small reward for mere goblin raiding. Begin an adventure in a dungeon world. Take the Dark Journey.